During the battle of Britain the main German fighter was the modern Messerschmitt bf109/E. Many of the best Luftwaffe pilots had seen action in the Spanish Civil War. They used this invaluable experience to develop tactics to suit the new high-speed aircraft. 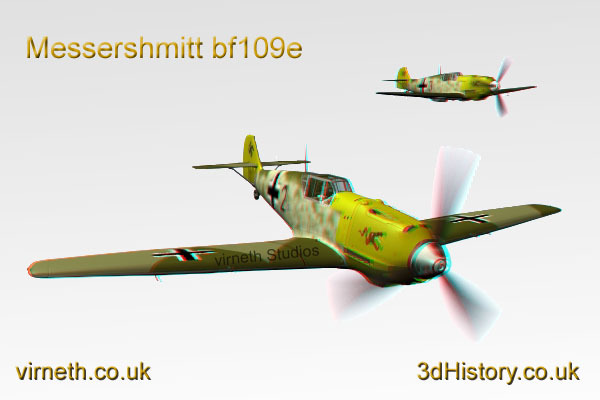 The bf109 was designed by Willy Messerschmitt in response to a specification for a new fighter issued in 1934. It utilised advanced design features for the day having a stressed monocoque body similar to a modern car, a fuel injected V12 engine, an enclosed cockpit and retractable undercarriage.